PETALING JAYA: With a non-broadcaster said to be the favourite to win the bid to sponsor the FA of Malaysia (FAM) for the next five years, the question of who will broadcast M-League matches on television has come up. However, industry observers and football fans feel this is not something that should be of concern. Zenith Media and IMG Global Sports are believed to be leading the race against the joint-venture of Astro Malaysia Holdings Bhd and Fox Sports Asia and the conglomerate of Telekom Malaysia Bhd and Media Prima. Datuk Johnny Mun, president of the 4As feels that Zenith as a media specialist is looking at revenue. “Hence it would have its technical people working on other things such as broadcasting issues. “In the spirit of free entrepreneurship, anyone can sponsor football. Football is an open business and as long as it is about promoting the sport, anyone can go in and sponsor,” said Mun. The Zenith-IMG bid is the highest at RM75 million, followed by Telekom Malaysia Bhd and Media Prima at RM70 million. Incumbent Astro is putting a bid with Fox at RM50 million. It currently spends RM30 million a year on sponsorship and RM20 million to air the matches. Both the proposals include broadcasting rights. 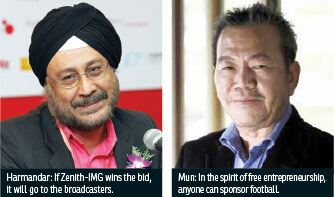 ADOI Magazine regional publisher Harmandar Singh said that FAM does not necessarily have to award the sponsorship deal to a broadcaster because broadcasting will obviously come into play even if a joint-venture company such as Zenith Media and IMG Sports Global win the bid. “If the conglomerate of Zenith Media and IMG Sports Global wins the bid, then it will go to the broadcasters. It could be Astro or Media Prima. It depends on the offer by Zenith and IMG Sports Global. “It will be interesting to see what would be the decision of FAM. The ball is in its court now and it will have to evaluate and see which proposal fits the bill,” said Harmandar. He added that Zenith Media together with IMG Sports Global have the capability to promote football in the country given the fact that Zenith has many clients under its wing and IMG is one of the leading media organisations in the world. Meanwhile, Malaysia football supporters club “President FAM Sila Letak Jawatan (PFSLJ)”representative Al Fadli Awaludin said fans would prefer to see FAM award the sponsorship deal to a non-broadcaster because it opens up the broadcasting rights. “This way it will be better for the fans because currently Astro has the exclusive rights but if a non-broadcaster sponsors, it can sell the rights of some matches to Astro, Media Prima and RTM. This way more matches will be aired and broadcasters can also make money. “Don’t forget that Astro is also a media company and it has been biased when it comes to player interviews and press conferences all this while. So, for a change it would be good to see a non- broadcaster holding the sponsorship rights and selling the broadcasting rights,” Fadli said. At the same time, he said FAM’s move to award the deal to a non-broadcaster would benefit the fans and the industry as a whole. However there are also concerns that rights issues may cost the fans. For example, three months ago Taiwan baseball collapsed due to an almost identical process involving the country’s favourite game. The Chinese Professional Baseball League (CPBL) accepted the highest offer from rights agency MP & Silva, which failed to secure broadcast deals — and pulled the plug within six months. Fans were left without any games on television while clubs had to approach television stations the CPBL had earlier snubbed. This lead to the resignation of CPBL Commissioner Hwang Jenn-tai. Fears are FAM may find itself in a similar situation which may result in television stations walking away from the league and refusing to deal with an agency. This article first appeared in The Edge Financial Daily, on November 21, 2014.